I have a confession. I’m really loving The Organic Gourmet Vegetable Bouillon cubes lately! The ingredient list doesn’t seem too bad, but it definitely has that salty msg taste. Anyways, they are easy when you don’t have any vegetable stock on hand and I really don’t like most brands of boxed or canned vegetable stock. 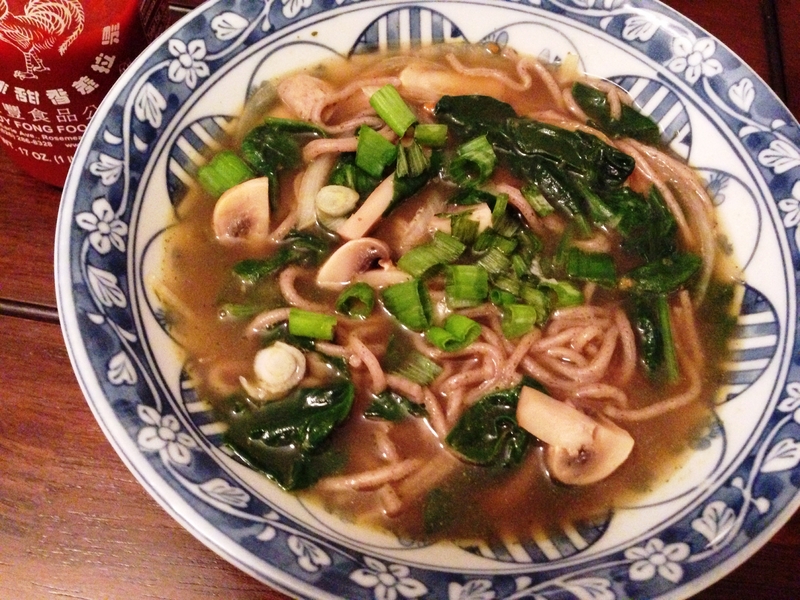 This soba noodle soup is simple, has subtle Asian flavors, and lots of mushrooms! Throw water, bouillon, soy sauce, rice wine, sesame oil, hoisin sauce, and ginger in a sauce pan and boil until the bouillon has dissolved and the flavors meld. Add the mushrooms and cook until soft. Then add the spinach and onion, then the soba noodles. Cook for just a couple of minutes and then top with green onions. Serve with sriracha!